As blossoming flowers herald the arrival of spring, the Cultural Heritage Administration is running several programs related to the royal palaces in Seoul. 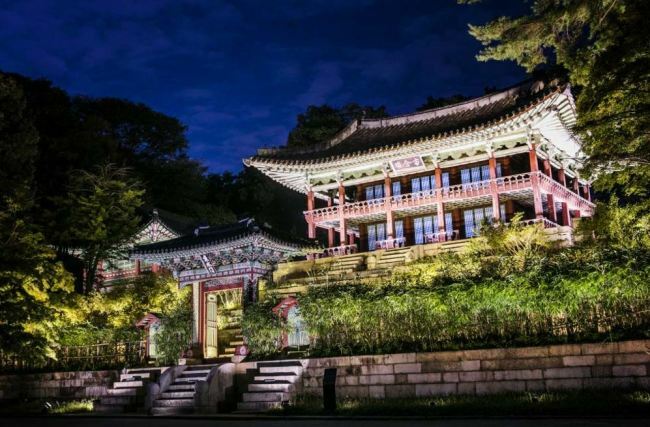 Changdeokgung Moonlight Tour, an annual event that kicked off in 2010, will be held from Thursdays through Sundays, from April 5 to the end of May, and from Aug. 23 to Oct. 28. There is no tour on May 6. 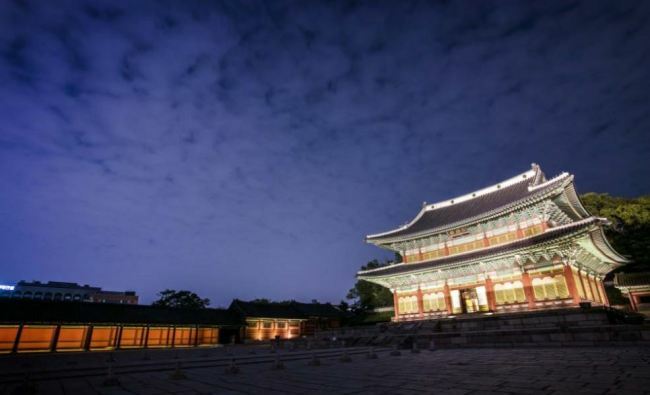 While visitors can freely roam the palace every day from 9 a.m. to 6 p.m., this program allows visitors to stroll around the palace in the nighttime, with guides providing commentaries and other programs available to experience Korean traditional culture. Foreign nationals can visit on Sundays, although those accompanying a Korean citizen can do so on other days as well. English, Chinese and Japanese commentaries are available on Sundays. Up to two tickets can be bought per person, and a maximum number of 100 visitors are allowed per day for the program. Tickets are available at http://ticket.auction.co.kr, or via phone at 1566-1369. The programs for the first half of the year went on sale online on March 21. For more information, visit www.chf.or.kr or call 02-2270-1243. For those who want a look at the inner sanctum of the palace, Injeongjeon of Changdeokgung will be open for viewing. The building, a national treasure, was where important state affairs like welcoming foreign envoys and the coronation of the king took place. The statue of the imaginary beast Fenghuang on the ceiling symbolizes the authority of the royal throne. The program runs from April to October, Thursdays through Saturdays, with commentaries at 10:30 a.m., 11 a.m., 2 p.m. and 2:30 p.m. The first tour is available to foreign visitors. Those who wish to visit can apply on the spot, free of charge. There is a 3,000 won entrance fee to Changdeokgung. Up to 30 people can participate in each tour. Tours are canceled on rainy days to protect the facility. For more information, visit www.cdg.go.kr or call 02-3668-2300. 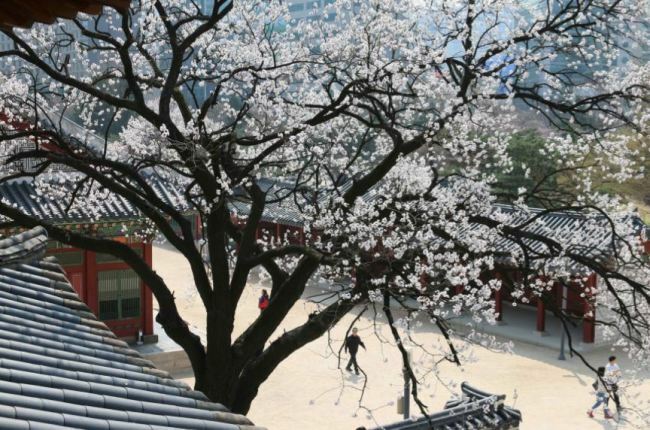 Deoksugung is offering daytime tours of its major buildings from Friday to April 5. The tours are provided twice a day, at 10 a.m. and 4 p.m.
Buildings open for tours include Hamnyeongjeon, where King Gojong died. He was also known as Emperor Gwangmu, the last king of Joseon and first monarch of the short-lived Korean Empire. The building served as the king’s bedroom and contains replicas of royal furniture used at the time. Each tour lasts for 80 minutes and the commentary is provided in Korean. Each tour takes up to 15 visitors and is free of charge. Applications for the tours can be made at www.deoksugung.go.kr. For more information, call 02-751-0740. 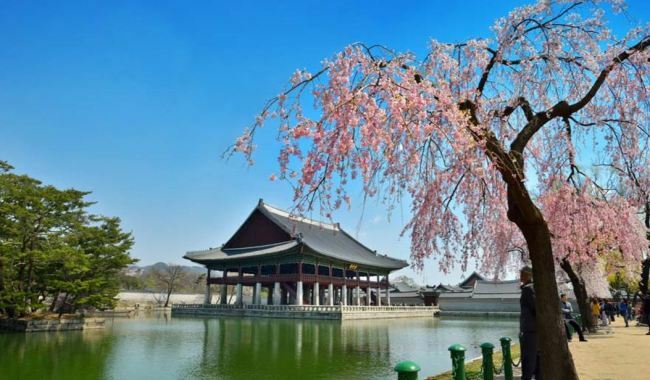 If you want a peak at how Korean royals kicked back and enjoyed flowers in bloom, visit Gyeongbokgung for a special tour of Gyeonghoeru Pavilion. 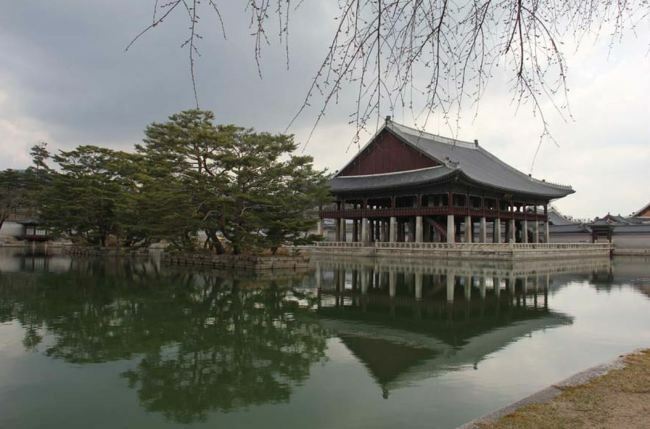 The pavilion was built on an artificial island surrounded by a pond and was used to host important events like state-level banquets during the Joseon era. It is usually inaccessible to the public. Special tours with Korean commentaries will be held from April 1 to Oct. 31. They are held three times a day on weekdays -- 10 a.m., 2 p.m. and 4 p.m. -- and four times a day on weekends, at 10 a.m., 11 a.m., 2 p.m. and 4 p.m. The tour lasts between 30 to 40 minutes. Up to 70 people -- 60 Koreans and 10 foreigners -- are allowed per tour. Those who wish to visit can sign up at www.royalpalace.go.kr. One person can book up to four tickets. Booking opens at 10 a.m. Monday. Step into Changgyeonggung between April 1 to Nov. 25 for a walk in the forest, royal style. 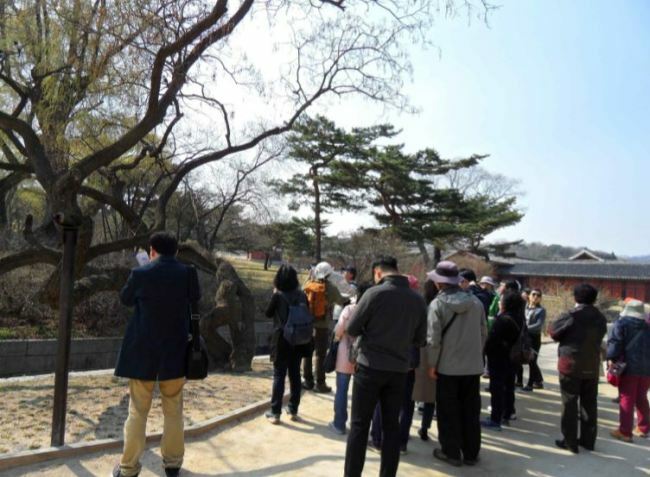 Tours of the palace’s forest will be held Saturdays and Sundays at 2:30 p.m., with commentaries on the history of ancient trees and the story of Joseon’s royal family offered. Changgyeonggung currently has 48,000 trees, including those that have stood there since the beginning of Joseon’s 500-year history. The program is free of charge. Entrance fee for the palace is 1,000 won. The tour lasts 90 minutes.